You know that weird limbo you find yourself in sometimes where time feels like it's flying by, but at the same time so much is happening that you're surprised every time you look at a calendar? That's where I am right now. I think this is the fastest I've felt like a semester has gone by since I started college. And to be fair, everything seems easy to me after last semester (aka the worst semester of my life) but still, I can't believe we're almost halfway done with March! That being said, I know it hasn't been very long since 2017 started. Like, 2 1/2 months. 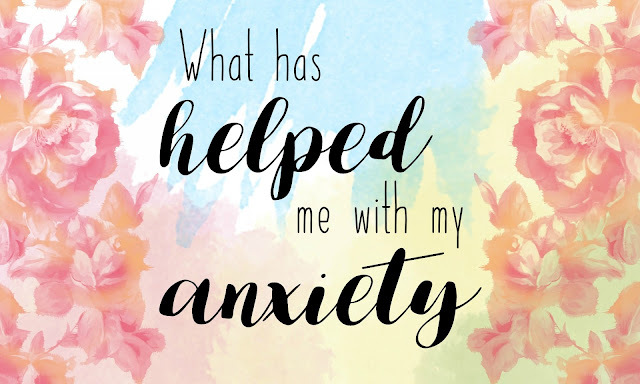 But I've been thinking a lot lately, especially in the past couple of weeks, how much my anxiety has improved this year, and I feel like I should wait a little bit longer to say "this is what helped" but I've seen so much improvement this semester that I decided there's no harm in talking about what's helped so far. I still have anxiety, and it still gets really bad sometimes, but overall I have felt a lot better this semester than I have in a long time. 1. I'm doing things that make me happy. We are all going to find ourselves in situations we don't like that we can't control. I mean, I'm studying journalism for goodness sakes, so I know I'm going to be calling strangers for the rest of my life (even though I never want to work for a newspaper again). For me, the joy I get out of writing and telling stories makes it worth it, which is a big deal. But when you can control what you're doing in your life, whether it's your job, your major, or how often you go out with friends, do what makes you happy. My friends tease me a lot about never socializing, but I need a lot of time by myself to decompress. I am completely happy with where I am as far as my social/volunteer/school life goes, and being OK with that balance has been key in improving my anxiety. The next thing is another situation that isn't always controllable. I didn't even control this, it just happened and I got really lucky. 2. I have my own room. Every semester I've been at school so far, I've had to share an apartment with five other girls and share a room with one other person. Last semester I was in an apartment with only four girls, and even though I still shared a room, it was really nice to not have so many people around. Then one girl moved out, and the odds were in my favor and I got my very own bedroom. And my goodness, it is hard to describe what a luxury that it. Sharing a room always made me really anxious because I was constantly worrying about being too loud or having a light on too long or when I should ask her to turn the light off or if my stuff was in her way or feeling like she was judging my side of the room or if she could see what I was doing on my computer or a million other things that don't really matter, but you know, anxiety. I also got a lot less sleep last semester because as sweet as my roommate was, she was super loud in the morning and tended to have a lot of alarms go off for no reason. But seriously, just being able to come home after a long day of being surrounded by people and know that I can be completely alone for a few hours is indescribable. I've really needed this. The last thing I'll talk about has a little bit of an intro: From January 10th for February 10th I was a vegan! I had read about it a lot over Christmas break and decided to try it for a month. I was going to write a blog post about it, but I honestly didn't have a ton to say since it wasn't really life-changing for me. The thing that surprised me the most was how easy it was most of the time (I used to hate vegans for saying that, so don't hate me) and how I just felt better overall. I didn't lose weight or see changes in my skin or anything, but I definitely felt better about what I was eating. 3. I've been eating healthier, and I know that has played its part in making me feel better. It's pretty simple actually: eating healthier makes me feel better overall, and that includes not only physical well-being but mental well-being as well. I don't worry as much about gaining weight or dying of heart disease (I wasn't eating that unhealthy before but you know, anxiety.) because I know what I'm putting in my body is good for me. I've also been making sure I work out a few times a week, and that combined with healthy eating has made me more confident in myself overall because I know I'm taking care of my body. Like I said, I'm not 'completely healed' or anything. I still worry constantly about everything, but I also notice little changes because they are significant to me. I will chase any relief from my anxiety.